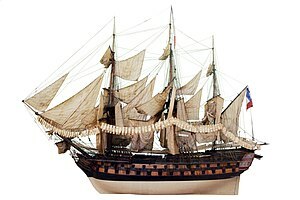 Scale model of Achille, a typical French seventy-four of the Téméraire class at the beginning of the 19th century. The "seventy-four" was a type of two-decked sailing ship of the line which nominally carried 74 guns. It was developed by the French navy in the 1740s and spread to the British Royal Navy where it was classed as third rate. From here, it spread to the Spanish, Dutch, Danish and Russian navies. The design was considered a good balance between firepower and sailing qualities, but more importantly, it was an appealing ideal for naval administrators and bureaucrats. Seventy-fours became a mainstay of the world's fleets into the early 19th century when they began to be supplanted by new designs and by the introduction of steam powered ironclads. As a standard type, the seventy-four was only an ideal construction. There was great variation between seventy-fours of different navies. In the period 1750–1790, different ships could have displacements of anything at just under 2,000 tonnes up to 3,000 tonnes. The armament could also vary considerably, with everything from 24-pounder to long 36-pounder guns, and some seventy-fours of the Danish navy actually had only 70 guns. The first 74-gun ships were constructed by the French as they rebuilt their navy during the early years of the reign of Louis XV. The new ship type was a very large two-decker big enough to carry the largest common type of gun (36-pounders) on the lower gun deck, something only three-deckers had done earlier. This great firepower was combined with very good sailing qualities compared to both the taller three-deckers and the shorter old-style 70-gun two-deckers, making the 74 the perfect combination of the two. A disadvantage of the 74 was that it was relatively expensive to build and man compared to the older type of two-decker. The 74-gun ship carried 28 (24-pounders- to 36-pounders) on the lower gun deck, 28–30 (18- to 24-pounders) on the upper gun deck, and 14–18 (6- to 12-pounders) on the upper works. Crew size was around 500 to 750 men depending on design, circumstances and nationality, with British ships tending to have smaller crews than other navies. The French had large and small seventy-fours, called "grand modèle" and "petite modèle", the waterline length of a "grand modèle" seventy-four could be up to 182 feet. This was copied by the Royal Navy in about two dozen such ships of its own, such as HMS Colossus where they were known as Large, while the other seventy-fours built to be between 166–171 feet (51–52 m) were known as Common. Inner arrangement of a Russian 74-gun ship. Elements of Sané's design are present, but with a British-style layout. Given the construction techniques of the day, the seventy-four approached the limits of what was possible. Such long hulls made from wood had a tendency to flex and sag over time. Increased maintenance could counter this to some extent, but this was of course costly. This limited the success of the even bigger two-deck 80-gun ships that were built in small numbers after the seventy-four had been introduced. Three-deckers did not have the same problem due to their additional deck giving more rigidity. The significance of the 74s however is hard to overstate, as a summary of the ships of the line for all nations that were in commission at any time during the Revolutionary/Napoleonic Wars period. The Royal Navy captured a number of the early French 74-gun ships during the War of the Austrian Succession (for example, Invincible, captured at the first battle of Cape Finisterre in 1747) and the Seven Years' War and was greatly impressed by them compared to its own smallish 70-gun ships. As a result, it started building them in great numbers from about 1760, as did most other navies. Navies that were restricted by shallow waters, such as the Dutch and Scandinavian navies, at least early on tended to avoid the 74-gun ship to a certain degree due to its size and draught, preferring smaller two-deckers instead. Even so, the seventy-four was a standard feature in all European navies around 1800. Only a handful of 74-gun ships were commissioned into the United States Navy; the US Navy's early sea power concentrated on its frigates. The type fell into disuse after the Napoleonic Wars, when improved building techniques made it possible to build even bigger two-deckers of 84 or even 90 guns without sacrificing hull rigidity. The last seventy-four, the French Trafalgar veteran Duguay-Trouin, was scuttled in 1949. Her stern ornamentation is on display at the National Maritime Museum, Greenwich. In addition, dozens of ship models exist, produced as part of constructing the real ships, and thus believed accurate both externally and internally. Wikimedia Commons has media related to Seventy-fours (ships). Jean Boudriot, transl. David Roberts, The Seventy-Four Gun Ship (Naval Institute Press, 1986) originally Le Vaisseau de 74 Canons, 1973. Four volumes document every aspect of the French 74, from shipyard construction techniques to handling under sail. Many large diagrams and drawings. This page was last edited on 16 January 2019, at 16:58 (UTC).